Below is an English script that is in many languages. If you have others please e-mail them to us. Anyone can draw and tell the major stories from Creation to New Life in Christ. Hello friend who speaks the English language. Did you know that all people from every country and every language come from the same family? This history is found in the true stories of the book called the Bible. Listen now to the history of the world and you will learn how to live in paradise after this life. God made the stars and the moon and the clouds. God made helpers called angels. God gave these angels the freedom to choose to serve God. God made a very beautiful angel who became proud. This beautiful angel chose not to serve God. We call this bad angel Satan. 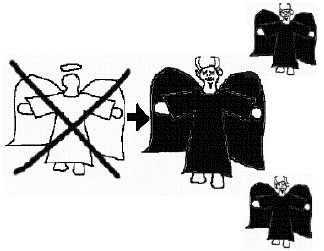 God expelled Satan from His presence. Many other angels followed Satan in a rebellion. These angels that rebelled against God are called demons. Satan and his demons have always been active making a war against God. They try to get people to serve Satan and not God. God made the earth and the plants and animals. God made the first man, Adam and put him in a garden called Eden. God then made a wife for Adam and named her Eve. God also gave Adam and Eve the freedom to follow Him on their own free will. In the Garden of Eden, God walked and talked with Adam and Eve. There was a tree in the garden from which God told Adam and Eve not to eat. One day, Satan spoke to Eve in the form of a snake. 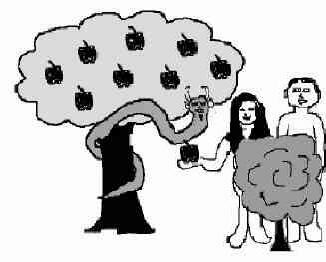 Satan told Eve to disobey God and to eat from the forbidden tree. Adam and Eve wanted to be equal to God. They chose to disobey His order and eat of the forbidden fruit. Because of this, God expelled Adam and Eve from the beautiful garden. Life became difficult for them, and they had to hunt and grow their own food. Adam and Eve then had two sons. One son was called Cain, and the other one was called Abel. 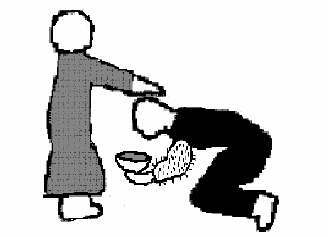 Cain and Abel wanted to serve God. They each prepared offerings for God. 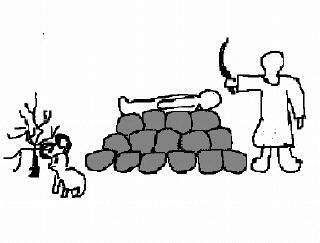 God liked Abel's offering and this made Cain very angry. 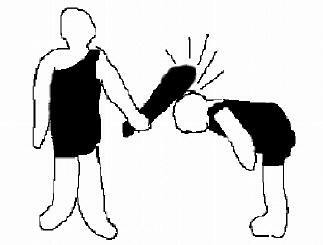 Cain killed his brother Abel. Cain, like his parents Adam and Eve, also had evil in his heart and sinned against God. The Bible says that every man and woman has a sinful heart that separates them from God. Many generations of people lived and died after Adam and Eve. The people forgot about God and became very evil, except for Noah and his family. 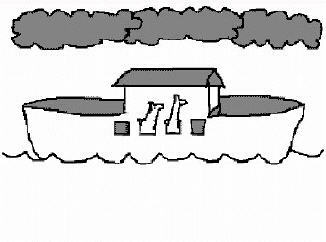 God told Noah to build a big boat and to put two of every animal into the boat. God sent a flood that destroyed every human, except Noah and his family. When the waters dried up, the boat landed on Mount Ararat which is in eastern Turkey. 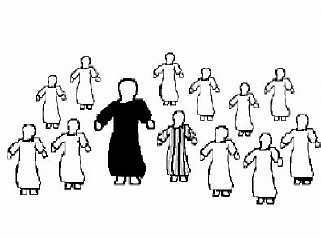 Noah's family multiplied and again the earth was filled with people. Many more generations lived and again the people rebelled against God. They should have worshipped God. They should have been thankful for their lives and food that God provided for them. Instead, they wanted to become a great nation without God. 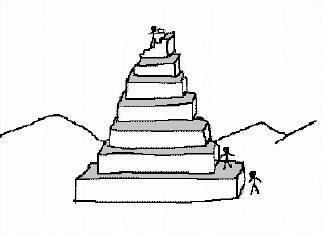 The people began to build a tall tower in a plain called Babel which is in Iraq. God saw how proud the people of Babel had become. God caused the people to speak in different languages so that each tribe would go its own way. So we see that God made every language. Keep listening and you will hear how God wants to bless every language group. Many generations later a man named Abraham lived in the city of Ur in Iraq. Abraham served and loved God. One day, God spoke to Abraham and told him that his people would become a great nation. For many years, they were nomads, living in tents and raising sheep for food. Abraham married Sarah and they had a son named Isaac. God tested Abraham's faith and asked him if he would be willing to sacrifice his own son Isaac. 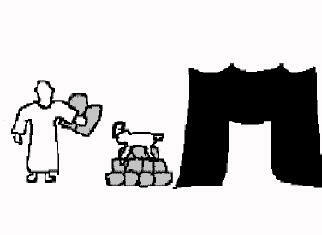 Abraham made an altar and was ready to kill his son Isaac. God did not require that Isaac be killed. Instead God provided a sheep which Abraham killed as a sacrifice. Blood sacrifice was important to God to clean the people from their sins. Isaac grew up and married Rebecca and they had a son named Jacob. Jacob was younger than his brother Esau. So Jacob tricked his father into giving the leadership of the family to Jacob. Isaac gave Jacob a special blessing after Jacob made some special food for his father. God changed Jacob's name into Israel. Jacob had twelve son's called the 12 tribes of Israel. One of Jacob's sons was named Joseph. Jacob loved Joseph and gave him a special coat as a gift. Joseph's brothers were jealous so they sold Joseph as a slave. Joseph worked in Egypt as a slave. God helped Joseph to become an important man in Egypt. There was a famine in the land. Joseph saved his family from starvation, and the 12 tribes of Israel moved to Egypt where they lived for many generations. Later, these 12 tribes became slaves of the Egyptians. God used His servant Moses to set the 12 tribes free. For 40 years after that, the tribes wandered in the desert and lived in tents. During this time, God spoke to Moses. Moses wrote down the laws that God gave him for the people to obey. 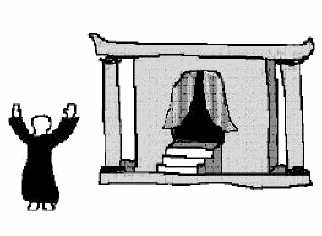 The people built a special tent where the priests would worship God. God gave the people many laws, such as do not steal, do not lie, only worship God, do not worship idols, and so on. God told Moses that when the people broke God's law they must sacrifice an animal to God. God would see the sacrifice of these animals and would forgive the sins of the people. The sacrifices were a substitute for the punishment that all people deserved. God brought the 12 tribes into the area that is now called Israel and Palestine. The people wanted a king. 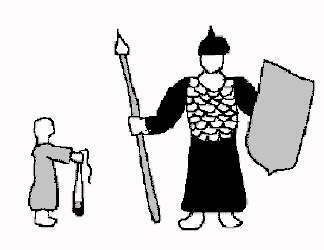 A boy named David killed a big enemy soldier named Goliath. The war was won and David became king. The people hoped that having a king would keep them close to God. David had a son named Solomon who became King. Solomon built a beautiful temple for people to worship God in. Even though the people now had a king and a place to worship God many of them still rebelled against God. Though God wanted men and women to live pure lives, they continued to do evil. Some people built idols and worshipped them instead of God. God sent many prophets to warn the people about what would happen if they did not return to following God. One of the prophets was named Elijah and he showed that God was more powerful that the idols. 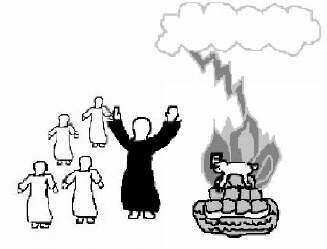 The bad prophets did not have special power, but Elijah prayed to God and God sent fire to burn up an offering. Even with these warnings, the people were stubborn and usually refused to listen. Rather than destroy the people, God promised to send a Prophet who would be the people's Savior. This prophet would be like a sheep and would be sacrificed to save the people. This savior's name is Jesus and he was born 2,000 years ago in a city called Bethlehem. His mother was Mary and she was a virgin when she miraculously become pregnant with Jesus. Mary then married her fiancé Joseph. Jesus was born in the city called Bethlehem. Jesus spent his childhood in the city called Nazareth. Now these places are in a Palestinian area and are very famous, and millions of followers of Jesus have visited them. When Jesus was grown, he left home and began to teach people how they should live and follow God. Thousands of people followed Jesus. They knew his teachings were from God. One day the crowds were so big that some people lowered a paralyzed man down through the roof so Jesus could heal him. Jesus made that man walk. Jesus had control over demons and made them quit living inside of some people. He taught his followers to love God with all their hearts and to also love their neighbors. The wise teachings of Jesus were written down. We can learn these teachings today when we read the Bible. The Jewish leaders did not believe that Jesus had authority and power. Jesus said, "I am the way, the truth and the life. No one comes to God the Father but by me." The religious leaders felt threatened by this. They made up some false charges against Jesus, and Jesus was arrested. 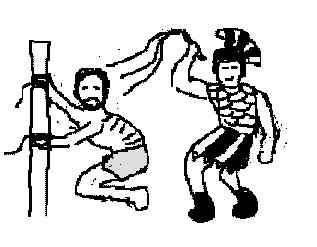 The Roman soldiers whipped Jesus as a punishment, but Jesus had committed no sin. Eventually, the Jewish people called for the execution of Jesus. Jesus was nailed to a cross in an execution given to criminals. Jesus had never sinned in his whole life, yet the people killed him like a criminal. 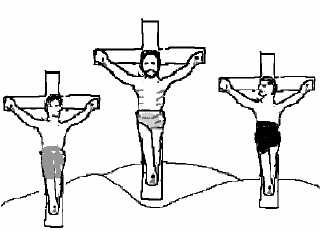 Jesus was hung on a cross between two criminals. One of the criminals believed that Jesus was the savior of the world and asked Jesus to remember him after death. Jesus said to him, "Today you will be with me in paradise." To make sure Jesus was dead, the Roman soldiers stabbed Jesus through the heart with a spear. 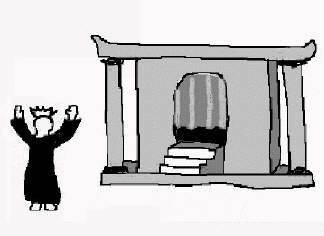 At the moment Jesus died, the holy curtain in the temple tore itself into two pieces. This was God's way of showing that everyone could now come to God freely. Jesus had become the final sacrifice that replaced the need for the priests to continue sacrificing sheep in the temple. 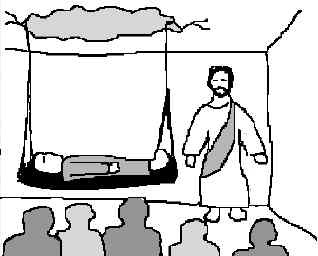 Jesus’ body was taken down from the cross and put in a sealed tomb. 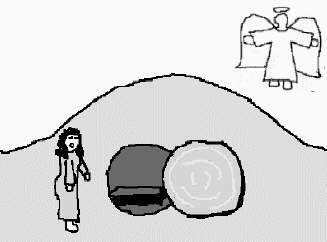 After three days Mary Magdalene one of the followers of Jesus went to the tomb in the ground. She found that the tomb was empty. 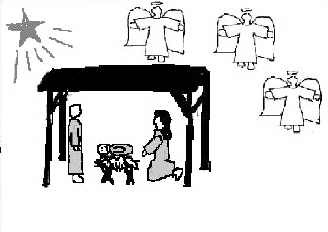 An angel announced that Jesus had risen from the dead. 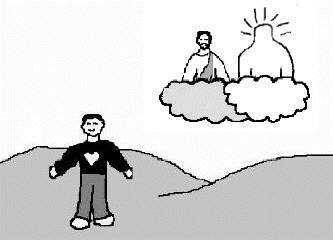 Later Jesus appeared to his followers. Jesus told his followers that they should go tell all the language groups on earth about him. Jesus said to teach people to believe in him for the forgiveness for their sins and to follow his teachings. Jesus said his followers should baptize these new believers in water. The water symbolizes a person has been cleansed from his sins. 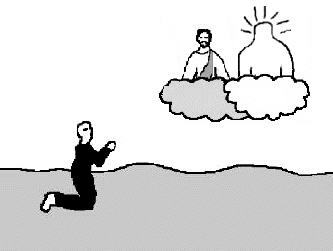 Jesus then was taken to heaven while his followers were watching. 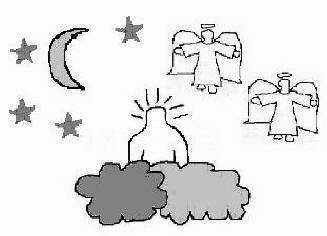 Now Jesus is in Heaven with the Father and Jesus prays for his followers. God filled all of the followers of Jesus with His Holy Spirit to give them power to share this message with other people. Now one in every seven people on earth says he is a follower of Jesus. Usually they are called Christians. You can find Christian churches in almost every big city in every country. Where Christians are persecuted, believers sometimes meet in their homes in secret. They eat together and pray and read the Bible and are like family for one another. 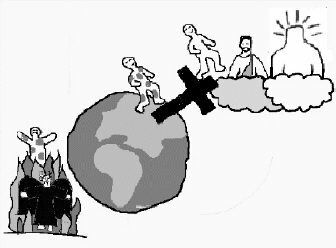 Before Jesus left this earth, he taught that there are only two places we can go after we die, either to heaven or to hell. Hell is a terrible place where Satan lives. People who do not go to heaven will suffer in hell forever. Heaven is a wonderful place full of joy and people will live in peace there forever. God is perfect and cannot allow sinful people into His heaven. All people have sinned except one. Jesus never sinned yet he was temped by Satan in every kind of way. Only the blood sacrifice of Jesus can clean people from their sins so they can go to heaven. Jesus' sacrifice on the cross is like a bridge we walk across to go to heaven when we die. As we trust in the blood sacrifice of Jesus, the sins that make us dirty are washed away. If you want to go to heaven when you die, you need to become a follower of Jesus. You must believe that Jesus was the sacrifice for your sins. Being a follower of Jesus will not always be easy. But it is worth the possible trouble in this life because it is the only way to go to heaven which lasts forever. Dear God, Although I have tried to be good, I know that my sins have caused a separation between you and me. I need a sacrifice that will make me clean and acceptable to you. I believe that Jesus was that sacrifice and that he died to clean me from my sins. I am sorry for the bad things I have done. I want to go to heaven when I die. Please save me from hell. Please protect me from all demons. Fill me with your Holy Spirit so that I can have the strength to live a clean life. If you prayed that prayer and believed it in your heart to be true, then you are a real follower of Jesus. The Holy Spirit of God now lives in your heart. You should pray to God often just like you would talk to a friend. Ask God to help you and He will. Memorize these stories from the Bible. Find a Bible and study it every day. Begin reading in the book of Matthew. Try to find other people who are followers of Jesus and meet with them and encourage one another. Living a life filled with the love of Jesus will make you a better person. When people notice that you are a better person, then tell them that Jesus has given you peace. Following Jesus can help you be a better member of your family and your language group. God will use you to be a blessing to your people. As a follower of Jesus, you will not need to fear anyone or any spirit. You will have peace in your heart.